A blog dedicated to the Atlanta Falcons that provides the latest news and original discussions. 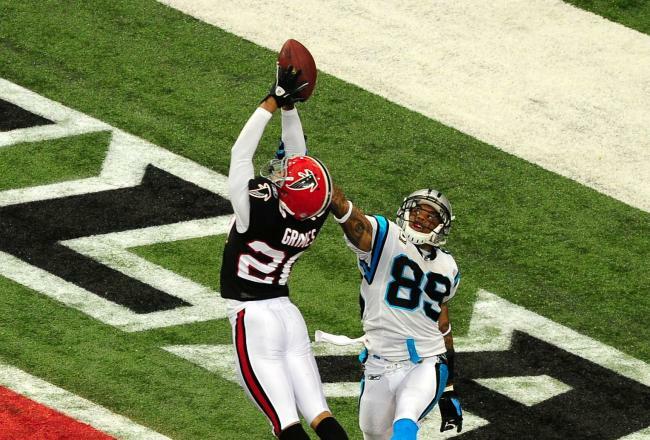 Former Atlanta Falcons cornerback Brent Grimes has agreed to a one-year deal with the Miami Dolphins. The deal is worth $5.5 million, and quite frankly, that’s a nice deal for Grimes. Grimes will be 30 years old in July and he’s coming off an Achilles injury he suffered in the season opener last year. When healthy, he’s undoubtedly one of the best cornerbacks in the league. However, it’s a risky investment considering his age and injury. The Falcons likely set an amount they were willing to pay Grimes, and he felt he could get a better deal elsewhere. The amount the Dolphins gave to Grimes was clearly out of the Falcons’ range, especially after the recent signing of defensive end Osi Umenyiora. Grimes’ departure means the current starters at cornerback are Asante Samuel and Robert McClain. Dunta Robinson was released before free agency began, and Chris Owens signed with the Cleveland Browns. Unless the Falcons believe McClain will play the outside as well as he’s played inside when on the field, the void at cornerback will likely be addressed through the upcoming draft. Washington cornerback Desmond Trufant is the name I’ve seen often falling to the Falcons in mock drafts. He also visited with the Falcons yesterday, so he’s clearly on their radar. As a undrafted, undersized free agent out of Shippensburg, Grimes had to prove himself to NFL teams. He got his chance with the Falcons, and it’s good to see him get money he worked hard for. He’ll be a fine addition to the Dolphins’ secondary. After several reports and updates, the Atlanta Falcons and defensive end Osi Umenyiora have agreed to terms on a two-year deal, as tweeted by Jay Glazer of FOX Sports. 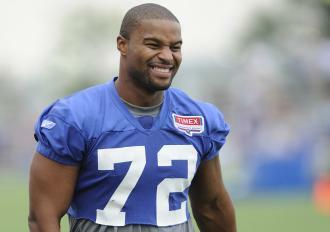 Last season, Umenyiora totaled just six sacks in a reserve role. However, he notched 20.5 sacks in years 2010 (11.5) and 2011 (nine) combined. The Falcons had a huge need for a pass rusher after releasing John Abraham, and Umenyiora figures to bring similar ability. The signing ensures the Falcons aren’t in dire straits heading into the draft, but the team will select another defensive end with one of its first picks. 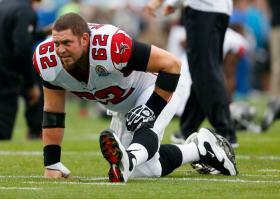 Atlanta Falcons center Todd McClure is set to announce his retirement today after 14 season in the NFL. The retirement ceremony will be available live on the team’s official website at 11:30 a.m. EST. The Falcons drafted McClure out of LSU in the seventh round (237th overall) of the 1999 NFL Draft. He took over as the starting center in his sophomore year, and he’s been the Falcons’ starting center up until now. Since 2001, McClure has missed just four games. The center holds the franchise record of 148 consecutive starts, which is a testament to his durability. The fact that McClure remained the starting center through five head coaches proved the former seventh-round draft pick was always an integral part of the team. Although McClure has been one of the better centers in the league throughout his career, he’s never made the Pro Bowl. Tyson Clabo attempted to get McClure voted into the Pro Bowl this past season, but to no avail. Aside from his durability, the most notable achievement of McClure’s career is his part in helping the Falcons lead the league in rushing for three consecutive years (2003-2006). It’s a shame McClure will retire without getting to hoist the Lombardi Trophy. He certainly deserves to after what he’s given to the Falcons. 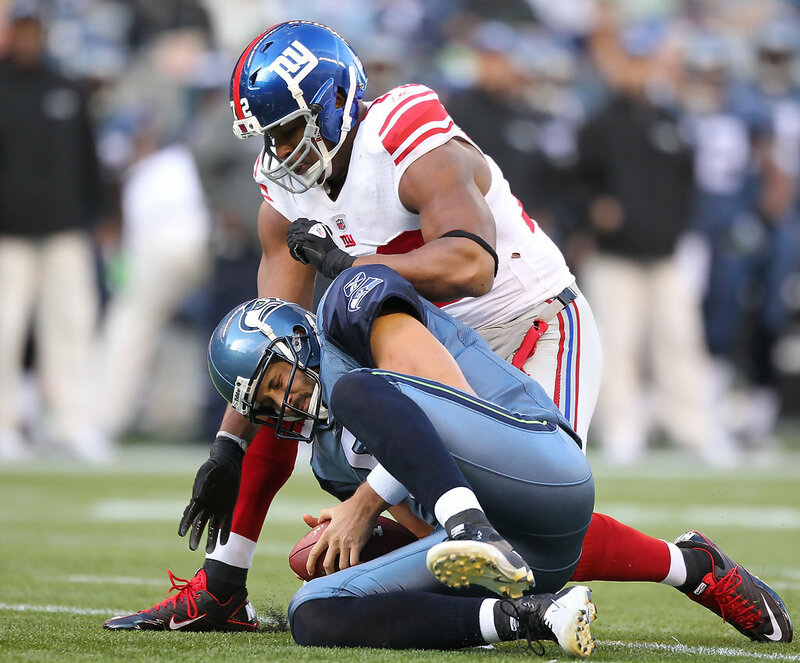 Former defensive end for the New York Giants Osi Umenyiora visited the Atlanta Falcons today, according to Mike Garafolo of USA Today via Twitter. The signing would make sense for the Falcons. 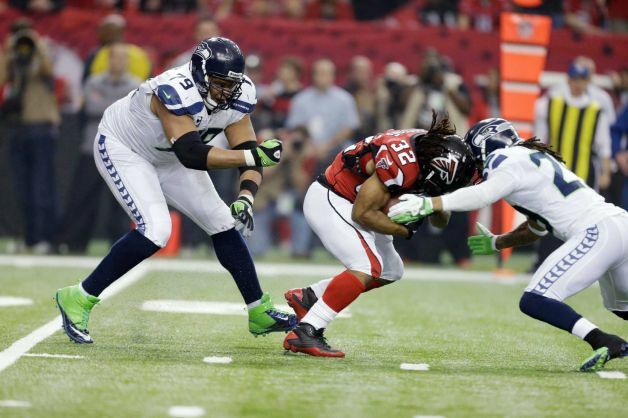 After releasing John Abraham, the Falcons have virtually no pass rushers on the roster. Umenyiora, 31, would immediately bolster the pass rush. For his career, Umenyiora has 75 sacks. On Wednesday, NFL owners approved of two new rule changes: the elimination of the “Tuck Rule” and the passing of a new rule that makes it illegal for a running back to initiate contact with the crown of their helmet. Despite the controversy of the new running back rule, it passed 31-1. Detractors of the rule include Hall of Fame running backs Marshall Faulk and Emmitt Smith. Chicago Bears running back Matt Forte also expressed his displeasure. A running back who leads with the crown of his helmet will incur a 15-yard penalty. It should also be a noted this rule is for runs that are outside the tackle box. Controversy aside, it’s the first rule change that provides protection for the defenders. The “Tuck Rule” was eliminated by a vote of 29-1-2. Unsurprisingly, the New England Patriots, who benefited from the rule in a 2001 playoff game versus the Oakland Raiders, abstained from voting. The rule enabled a fumbled ball moving forward in the hand of a quarterback to be called an incomplete pass. The Atlanta Falcons have received four compensatory picks (a fourth-rounder and three seventh-rounders) in the 2013 NFL Draft. The league uses a formula to determine which teams lost more or better free agents than gained the previous year. Last season, the Falcons lost cornerback Kelvin Hayden and wide receiver Eric Weems to the Chicago Bears, linebacker Curtis Lofton to the New Orleans Saints, and safety James Sanders to the Arizona Cardinals. With the newly awarded picks, the Falcons now have 11 selections in the upcoming draft. 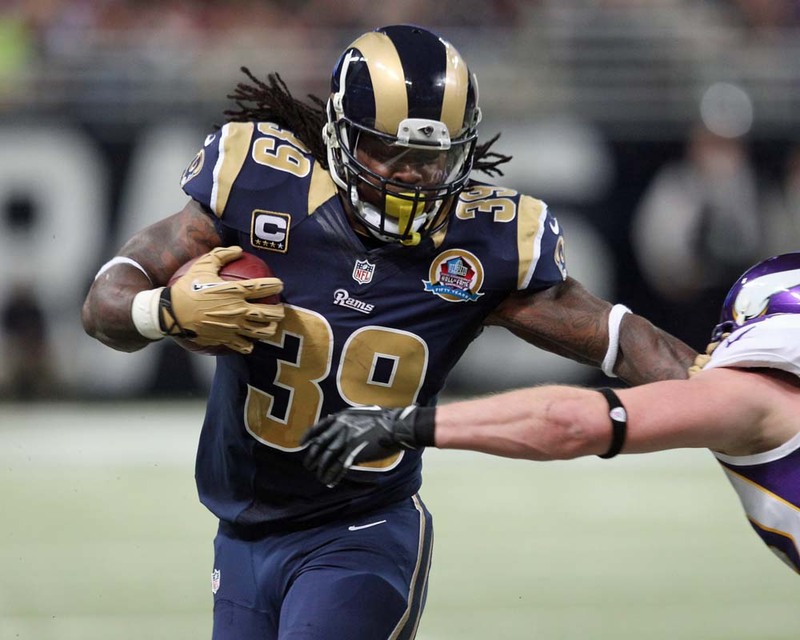 The Atlanta Falcons have agreed to terms on a three-year contract with running back Steven Jackson on Thursday. The Falcons had a hole at the running back position after they released Michael Turner. Even so, the running game was largely ineffective in 2012. The move to sign Jackson changes that. Although the running back will be 30 years old once the season starts, he’s a perfect fit for Atlanta’s offense with his ability to catch the ball. Jackson voided the last year of his contract with the St. Louis Rams to become an unrestricted free agent. He wanted to play for a contender, and he got his wish. With Matt Ryan, Tony Gonzalez, Julio Jones, Roddy White, and now Jackson, the Falcons offense is set and could potentially be the best in the league. Now it’s time to address the defense. 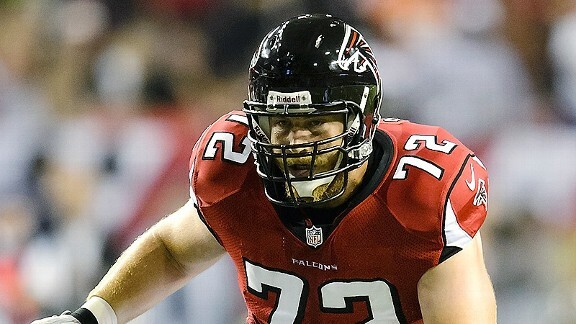 The Atlanta Falcons have agreed to terms on a six-year contract with left tackle Sam Baker. After having a terrible, injury-riddled campaign in 2011, Baker justified the front office’s faith in him by having the best season of his career. Baker has been protecting Matt Ryan’s blindside since 2008, and it’ll look to continue for the foreseeable future. The Falcons promised to make retaining their own guys the main focus for this year’s free agency, and they’ve made good on that promise. The Atlanta Falcons’ offseason just got a lot easier. 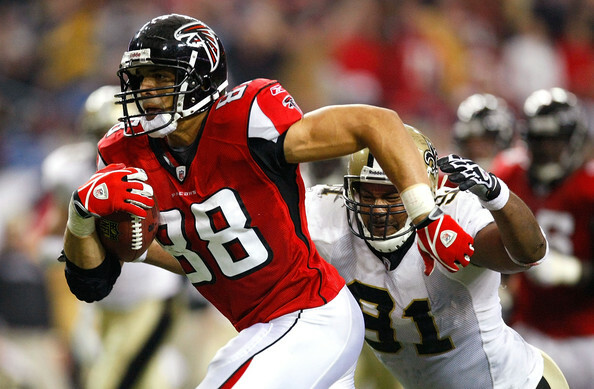 As reported by FOX Sports’ Jay Glazer, Tony Gonzalez has informed the Falcons he’ll return for more season. There’s no doubt this is huge news. Last season, Gonzalez had 93 receptions for 930 yards and eight touchdowns at 36 years of age. In the postseason, he added 14 receptions for 129 yards and two touchdowns. He clearly still has plenty left in the tank. The Falcons’ victory over the Seattle Seahawks was the first time in his 16-year career he had ever experienced a playoff victory. The Falcons failed to reach the Super Bowl, and Gonzalez told Glazer he’s coming back for one reason only: To win the Super Bowl. I'm happy to say that after speaking with my family, I'm coming back. The lure of being on such a great team and organization, along with unbelievable fan support was too good to pass up. We have a great shot to get to the Super Bowl, RISE UP ATLANTA! As a Falcons fan, I’m ecstatic. It’s a great start to free agency. Bring on the 2013 season! Along with re-signing strong safety William Moore yesterday, the Atlanta Falcons also re-signed right guard Garrett Reynolds. Reynolds opened last season as the starter at right guard before being placed on injured reserve with a lower back injury. Rookie Peter Konz then took over at right guard. Before going down, Reynolds played well. I would assume his re-signing means the Falcons are indeed moving Konz to his natural position at center. 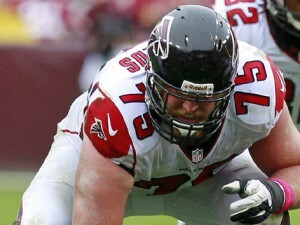 Last season’s starter at center and long-time Falcon Todd McClure will be a backup if he’s re-signed. Kendall became a fan of football in 2003 after playing Madden NFL 2003 for the PlayStation 2. Because he lives in Georgia, he chose to root for the Atlanta Falcons. He had no idea what he was getting himself into. The Elevator A good friend’s blog – check out his artwork!